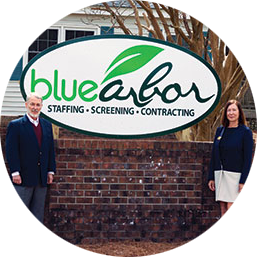 Blue Arbor is a full service human resource company providing businesses across the country with recruiting, staffing, background checks, and drug screening services. For 35 years, Lucine Moffett has taken pride in placing trustworthy and skilled employees in primarily manufacturing, construction and clerical roles. Seeing the stability of government hiring through natural disasters and the economic downturn led them to diversify by investing in government contracting, which now makes up roughly 20% of their gross sales. Blue Arbor also manages Atlantic Gulf Coast Contracting Inc. (AGCI) which specializes in construction, renovation, and disaster recovery. WHAT INSPIRED YOU TO START A STAFFING COMPANY? I’ve been working since I was eight on my uncle’s tobacco farm. At 16, I got a job driving a school bus, which they’d never allow now, but I’ve always been a hard worker and the people in my life were entrepreneurs who inspired me to pursue my dreams. When I was 24, I had been working for Texas Gulf for seven years. It was 1981, and I saw first hand how women were hardly being recognized or promoted. I was thinking about that when I realized there weren’t any staffing companies in New Bern. So, I started what was then Temporary Employee Services, Inc.
HOW HAS THE SBTDC BEEN USEFUL TO YOU? We’ve worked with the SBTDC primarily for Government contracting assistance. One of the areas where our counselor, Ariana, has been so much help is deciphering the somewhat ambiguous rules and regulations around submitting proposals. Interpreting the language correctly can make the difference between winning a contract and not. Each contracting officer views the regulations differently. I can present the Request For Proposal to Ariana, and she is able to make suggestions as to what aspects are uniform and what may be left up to interpretation. Sometimes they are strictly looking for the lowest price. Other times it may be experience in the field. Ariana knows based on her years of experience seeing what other companies have discovered when dealing with that agency or officer. She is truly an asset to your organization as well as an asset to ours. I can’t say enough in terms of how much she has meant to our efforts. One specific instance, we sent in a proposal for a GSA contract. We knew they received it, but we couldn’t get a response from them in over a year. One of the Senators got involved and the needle moved slightly. Then I mentioned it to another SBTDC counselor, Nick Economou, who used to work at the GSA. He made a few calls and suddenly they were calling us instead of us calling them. HOW MUCH GROWTH HAVE YOU SEEN IN THE LAST FIVE YEARS? We’re focusing on all of the municipalities in the state of NC, and then we’ll move from there. We’ll go to South Carolina, Georgia, Virginia, Mississippi, all along the Southeast. We’re already traveling quite a bit and that is likely to increase, so I have to tell you because I’m so excited, I bought a plane. Her name is Amelia and she has Amelia Earhart’s picture on her side. Between here and Pensecola, it takes about 4 hours, which beats the heck out of 12.5 hours driving.